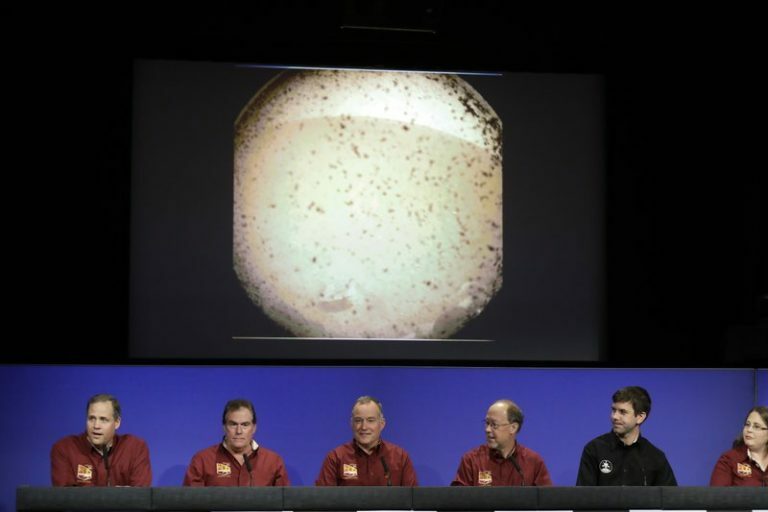 The picture was speckled with dirt because the dust cover was still on the lander’s camera, but the terrain at first glance looked smooth and sandy with just one sizable rock visible — pretty much what scientists had hoped for. Better photos are expected in the days ahead. InSight, part of a $1 billion international mission, features a German-led mechanical mole that will burrow down 16 feet (5 meters) to measure the planet’s internal heat. Nothing has ever dug deeper into Mars than several inches. The lander also has a French-made seismometer for measuring quakes, if they exist on our smaller, geologically calmer neighbor. The 800-pound (360-kilogram) InSight is stationary and will operate from the same spot for the next two years, the duration of a Martian year. Its first job was to get a fast picture out. The next task was unfolding its solar panels. NASA wanted to wait 16 minutes for the dust to settle before attempting that; it was awaiting word Monday night on how that went. It will take months to set up and fine-tune the instruments. Lead scientist Bruce Banerdt said he doesn’t expect to start getting a stream of solid data until late next spring, and it may take the entire mission to really get the goods.